As the bears began to awake, with the light of the first strong rays of the sun, they realized how long a sleep they had been enjoying and how much death, destruction, famine, sickness and suffering had happened since they first closed their eyes for a long winter sleep. The light, which had peeked through the narrow opening of their caves shined on many things now other than their eyes. One of these other things was Coyote's half truth's. Coyote had been very busy during the time when the bears were asleep spreading fear, anger, and leading ones to believe he had changed laws, which would protect and secure everyone's life, liberty and pursuit to happiness and well being. Coyote had also had gathered ones who had agendas and goals similar to his own and said these new things would help to protect the people and the land. The sun's first rays begun to shine on some of the two legged waking them also. It shown on their true beings. Many were beginning to see truth for the first time since their sleep began. This caused them to have many emotions and thoughts they had not had before. Many had lived a life of complacency and gave little thought or regard to their lives or the lives of others around them. Now they realized life as they had known it to be had just been an illusion. The time for dreaming was over and it was a time now to be cautious and see the realities, which their existence and their greed for money, power and control along with their well fed egos filled with jealousy and vanity, which had caused a once beautiful and perfectly created world to become the cause of death for all and all things. It was said long ago that when the bears woke up it would be the beginning of the end of things, as they had always been known and the birth of a new time would be upon all the land, the waters and even to the air all breath. As the bears woke from their slumber they found Mother Earth sick and in labor pains, their waters were no longer pure and clean or safe to drink, the air was now thick and gray with poisons which the winds carried far and wide across all the lands. The 4 legged, the wing peoples, the tall ones and the green ones were all sick and weak, even the 2 legged had become weak and sick from all they were and all they possessed with their infinite knowledge and great books. Now they looked not for a solution but for ones to blame. The two legged began to kill. Some justified their killing of the animals by their interpretation of the great book which gave them dominion over the animals and all things, never once seeing the true words which had been given to each and placed in a safe place to be never lost, stolen, or taken from them. These same ones sometimes waged war on their own kind and again justified the killing by their great book and their interpretation of the words written therein. They had not heard the words of truth in the messages Eagle had brought them nor had they seen the blood spilled on the road which poured from the body of the Bison they had killed. They killed the Wolf and all the great teachings Wolf had once shared with all. Now the Bears upon waking were no longer to be fooled. In the light which shined through their cave they saw the wake of the destruction in their absence, which had been caused by man and his fooliness to follow the ways of Coyote. From this day forward neither man nor true man would be safe nor allowed to sleep or dream. Those foolish enough to believe others would protect them and theirs would be allowed to live for a time. In this time though they would forfeit many precious things, among those things would be freedoms which until now they had enjoyed. 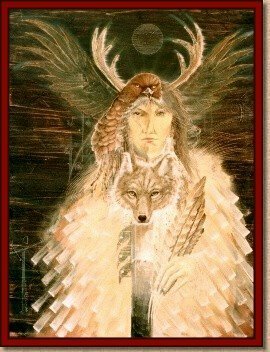 Coyote was alive and well at this time and he had many wonderful gifts for these foolish ones. Coyote told them he would protect them, would flush out their enemies and all the evil in the world today. Coyote knew it would be easy using the two legged great book to prove he had the power to do these things. Why he talked it very well. Those who would denie Coyote had to be against all, not just against Coyote. The bears were not fooled by Coyote. Coyote had fooled them once before a very long, long time ago. 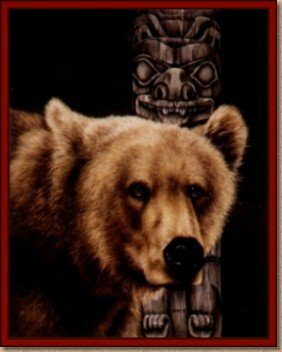 Remember the story about the time when the animals had been hurt by man and the bear clan felt sorry for man and helped man..hmmmmmm their punishment had been no longer would any talk to man again and the bears would from that day sleep through the winter months until it was time for them to wake up. Oh no, the bears would not be fooled again by Coyote nor by man. Now as the bears joined the others in the forest under the bright sunshine of daylight they looked around for Coyote and upon catching sight of him the bears took off chasing him with teeth bared and great roars waking those still asleep and sounding the first alarm and call to destroy Coyote and his false promises and half truths along with all things in their path that were not of the true ways of CREATOR.